Think about all the time and energy we spend deciding what to wear. We spend time in the morning (or the night before) deciding on what’s best for the day, often sifting through item by item thinking about what fits well or not, and what looks good or not. We may think about how we spent too much on some things, and never wear others. We spend our mental energy during the day wondering if we chose the right clothes, comparing to what others are wearing or worrying about what other people think about what we are wearing. And sometimes we think about our wardrobe when we get emails with special offers, or noticing trend alerts while flipping through a magazine or scrolling through social media. It’s different for each of us, but other triggers to think about our clothes include changing seasons, moods, and upcoming events. Whatever our different triggers and thoughts are, I’m sure we can all agree that we spend too much time thinking about what we wear. Limit your decision-making with fewer choices. Store or donate items that don’t fit your body or your lifestyle and only choose from your favorites each day. If you need help with closet chaos, try finally cleaning out your closet for good. Eliminate decisions by creating uniforms. For instance, wear the same outfit when you travel. Choose one or two looks for date night, community meetings or other repeat events and occasions. For example, I wear a t-shirt, leggings, sweater and scarf when I travel and I wore the same black dress to every formal event for years saving a bunch of time, money and energy. I’m bored with my wardrobe. Everyone will notice I’m wearing this again. Instead remind yourself that you have enough and that you have more important things to focus on, Remember that shopping for new clothes won’t cure boredom (curiosity does that), that you deserve way more than something new to wear AND no one cares what you wearing. These 3 shifts will help you streamline wardrobe decisions so you can devote your time and attention to what really matters to you. If you do have the thought, “Everyone will notice I’m wearing this again,” I think it’s helpful to remember that those who love you will admire your simple lifestyle and frugality, and those that are critical . . . well, they aren’t your true friends anyway! I know you have brought up this point before, that no one notices what we wear, but I thought I’d share this true but funny story. I work at a senior center & one of the ladies that comes in on a daily basis, wore two different earrings, by mistake one day. (She has short hair so you are able to see her earrings.) The next day she wanted to know why no one told her that she had two different earrings in. NO ONE NOTICED!!! I conducted my own experiment…wore the same jean skirt (different shirts) two days in a row & NO ONE NOTICED. I’d love to take a closer look at your fall wardrobe, to get a better idea of how it works. I love the rotation idea. I rotate navy outfits and black outfits. I don’t think anyone notices or perhaps don’t care what I wear. Another great post, thank you! 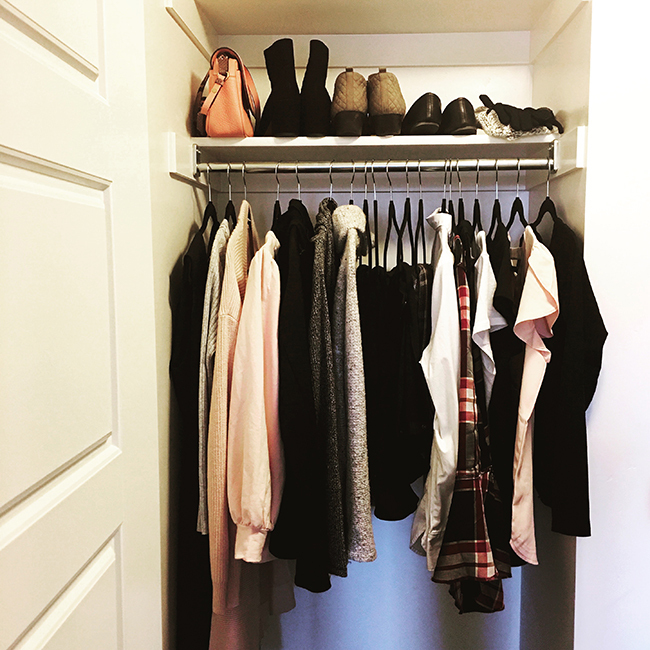 Even if I don’t live with a capsule closet (I’ve tried it for a couple of month, though), I’m always fascinated by this approach and, over the years, I’ve downsized my wardrobe a lot and I’m much happier now. I think that it’s also important to focus our own shopping triggers and face who we really are: my challenge as a real fashion lover is to find new and creative ways to fight fashion boredom and satisfy my love for style, and creating new outfits without shopping! I would really appreciate a post about this topic! Men in white collar jobs do this all the time, especially new (poor) struggling lawyers. They wear the same 5 suits, one for each day of the week. Last night in my law class, our debonair dressy guy was in yet another flashy suit. One of the other men commented that he must have 100 different suits. He said he only has twenty. He just rotates them and everyone thinks he has a huge wardrobe! I work four days a week in a crappy government job. I wear two pairs of pants, twice. NO one notices or cares. This is really helpful, I especially like the part about reframing our thoughts to our priorities when struggling with our wardrobe.